On Monday 11 February at around at 18h51 Turkish local time, a military helicopter crashed into the residential neighbourhood of Cekmekoy district, in Turkey’s busiest city of Istanbul. The incident claimed the lives of four Turkish soldiers. According to Turkish officials, the helicopter was trying to make an emergency landing when the unfortunate incident happened. Istanbul Governor Ali Yerlikaya spoke from the crash site stating that four soldiers had perished in the crash and that no other military personnel or civilians had been injured when the helicopter hit the ground in the residential area on the Asian side of İstanbul. According to reports from Gökhan Artan, a correspondent for Demirören News Agency (DHA), the make of chopper that crashed, a UH-1, has been involved in many accidents throughout the years, five of which occurred in Turkey during its 17-year service term. It has also been claimed that UH-1 model helicopters were planned to be scrapped from the inventory of Turkish Armed Forces (TSK) this year. The first flight of a UH-1 was on September 22, 1956, and was put into service in the US army in 1959. The last production date of this the helicopter was in 1976 – none have been produced since then. A pioneer of the Bell series helicopters, the UH-1 model has not been used by the US Army since 2004. UH-1 helicopters were once a symbol of the Vietnam War and were designed for ‘search and rescue’ missions as well as for transportation and pilot training. On November 8, 2002, a UH-1 helicopter crashed while it was making an emergency landing at the 6th Main Jetfighter Base in Bandırma, western Turkey. A total of six military personnel were injured, two of them seriously. On March 16, 2006, on the way to the eastern Turkish province of Erzincan, a UH-1 helicopter hit a high-voltage transmission line 55 km away from Erzincan. Five soldiers lost their lives and one escaped with injuries. On April 10, 2006, another UH-1 personnel carrier helicopter crashed near the northwestern Turkish province of Kocaeli’s Uzunçiftlik town. Three military personnel lost their lives as a result of the accident. On January 10, 2011, a UH-1 training helicopter crashed during a training flight to the Polatlı district of the Turkish capital city of Ankara. 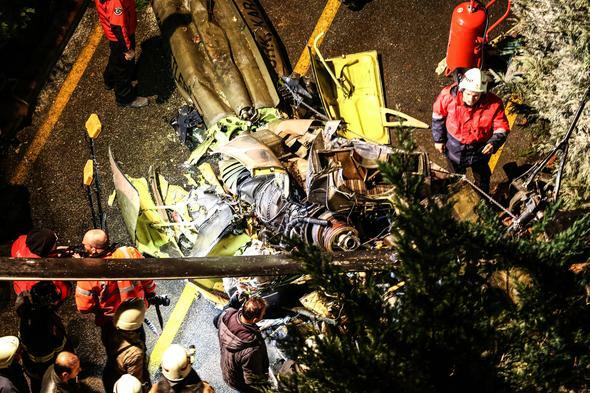 On November 26, 2018, another UH-1 military helicopter crashed into a residential area in İstanbul’s Sarigazi neighbourhood. Five soldiers were killed.